Curry tallied 15 points (5-6 FG, 5-5 3Pt) and an assist in 16 minutes Monday against the Cavaliers. Curry converted on all five of his 3-point attempts, although he failed to contribute much elsewhere. He did lead the Trail Blazers' bench in scoring on the way to a 123-110 victory on the road. 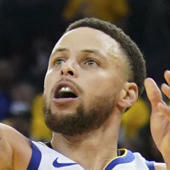 Although Curry has scored 11 or more points in three of his previous five matchups, his 6.2 ppg average on the season doesn't give fantasy owners much confidence that he can maintain this recent level of play.